As America prepares to celebrate Independence Day, we need to remember that the people who gave us this holiday openly (and, thankfully) rebelled against and rejected the serial and unrelenting oppression they were victimized by for decades. How is it that “the church” so easily forgets that Jesus came to “set the captives [oppressed] free”? As I’ve mentioned before, God speaks condemningly about oppression and oppressors 84 times! Why, then, do those who claim to speak for Him refuse to follow His mandate to intervene and put a stop to it when it is happening among their own congregations? Each instance of hearing these words from beloved friends and Christ-followers dealt a blow so harsh to me that I remember every detail about the conversation. There was a victim and a perpetrator in my marriage. A crime was committed and it continued for years. The collateral damage was great. And yet, Christians could respond as though this was simply another case of marriage being difficult and no one really being right or wrong. I lived the pain of these words of indifference many times over. My Biblically-oriented church was inept at counseling us. Since I was desperate to save my marriage, and my ex-husband would settle for nothing less than keeping a toehold in his sin patterns, I was the one expected to acquiesce, accept empty words as evidence of repentance and change. This attitude taught by pastors inevitably influences those hearing their teaching. I too used to take a black and white attitude toward divorce and always believed there was something either party could do to save a marriage until I was confronted with my own situation in which I could do nothing outside of enabling sin to save my marriage. One day I read God’s directive for what the church was to do in this instance. It is one of the clearest directives in the Bible. It’s right there in 1 Corinthians 5:11. “But I am writing to you not to associate with anyone who bears the name of brother if he is guilty of sexual immorality.” Read on. This is harsh in order to give the offender every reason to turn away from recurring sin patterns that lead to death. It’s why we would scream harshly at a child who was about to run in front of a moving car. The Lord wants us to take these ongoing sins that seriously. This journey started five years ago for me. I have learned and grown in the Lord. He has taught me to listen to Him and to take no human’s teaching as accurate without checking it against the whole of His word. There is only one source of truth. I know the myth of God valuing marriage above human beings continues. It is not true. Friends and families and pastors who are misguided and continue to counsel for saving a marriage above all are doing tremendous damage to people who are already victimized. What needs to be done is to follow the Lord’s direction regarding the immoral within the church and to enforce church discipline “for the destruction of the flesh, so that his spirit may be saved in the day of the Lord.” (1 Cor. 5:5). When I read the following from Gary Thomas my soul was warmed by the truth of it. May the Lord bless you in your service to Him. Speak out against oppression everywhere, and especially in the church! *sigh* Pastor, STOP Being a Bully! What?! Are you KIDDING me?! This is cult-talk, not Christian Church talk. This is bullying, not leading. This is oppression, not Christian servant-leadership. If you are in leadership in the church and this is your attitude, you need to get on your face and repent, begging God to change your heart and protect you from His due punishment for oppressors (Malachi 3:5; see also Psalm 94:20, Jeremiah 25:34; Zechariah 9:8; et.al.). In fact, God has something to say about oppression and oppressors 84 times in Scripture…it is SO not okay with Him! Jesus gave us His example of leadership (see the story of Jesus washing the disciples feet, for example, in John 13, especially John 13:14, 15, 17). If you think your position in the church entitles you to “lord it over” (bully and oppress) those you are there to serve, better go back to Bible school – if you ever went. You are there to serve, NOT to be served. You are to gently lead from in front, not drive from behind (that’s the role of the butcher!). Also, there seems to be a great deal of confusion about what authority is and what it isn’t. Bottom line is this: NO one “has” any authority; they simply exercise the authority God in Christ has assigned TO A POSITION, NOT A PERSON. Example: If you get elected mayor, you will exercise the AUTHORITY OF THE POSITION of mayor until you are no longer mayor. Once you are no longer mayor, YOU NO LONGER EXERCISE THE AUTHORITY of the position of mayor. If you serve as a pastor or other elder, your exercise the authority of that POSITION, and it DOES NOT belong to you! Oh, and this nonsense about “spiritual authority?” Go back and read Matthew 28:18 and Ephesians 1:22 – again. And before you take Titus 3:1 out of context (“Remind them to be subject to rulers and authorities, to be obedient, to be ready for every good work.”), this was part of Paul’s instructions to Titus on teaching the people in his congregation about how to treat THOSE OUTSIDE the church. Some of the variants of this word are translated “But the ruling priests and the elders persuaded (epeisan | ἔπεισαν the crowds …” in Matthew 27:20; “And if this should come to the governor’s ears, we will bribe (peisomen | πείσομεν ) him…” Matthew 28:14; and “He also told this parable to some who were confident (pepoithotas | πεποιθότας) in themselves…” Luke 18:19). It seems quite clear that the idea of “obeying spiritual leaders” is not consistent with what God’s Word actually teaches, doesn’t it? For those of you who think that a pastor or husband or father IS the authority or HAS authority, you have been deceived. Throw that off. Not only is that a man-made construct, it is oppressive at base. Christ’s leadership was a servant-leadership. It was self-sacrificial, not self-serving ( “…just as the Son of Man did not come to be served, but to serve, and to give His life a ransom for many.” Matthew 20:28). It was for the good of us, not for the good of Him (Ephesians 5:25), and He had a passionate desire for God’s best for us, even if it cost Him everything (Philippians 2:3-11). Pastor? Elder? STOP IT AND BE WARNED! For those who agree with God on the exact nature and character of their wrong, He provides forgiveness and cleansing (1 John 1:9). It requires a contrite heart to be truly repentant and confessing (Psalm 21:7; Isaiah 66:2). Serve others as you have been commanded, or relinquish the position you are not entitled to because of your oppression. He will not long tolerate His sheep being oppressed. Love is probably the most sought-after and least understood aspect of the human experience. We long for it, we hunger for it, we actually need it, and yet those things are at the very root of our inability to Love God’s Way. Nice thoughts; great words; lovely sentiments. You’ve seen them on greeting cards, plaques on the wall, even hundreds of times on Facebook. What do they mean, and who are they for? Agapē is rooted in the very nature and character of God (1 John 4:8, 16b). Agapē is self-sacrificial (see Philippians 2:5-8). The verb form of this word means to love, highly value, honor, greatly esteem, manifest lavish concern for, be faithful towards, to delight in, and to emphasize the importance and value of another. To love God’s way is to give; there is no “take” in love (although there is a “receive” aspect to it which we will discuss in a moment). To “love” someone with any expectation at all of anything coming back in return is NOT love – it is a business deal, not relationship. Quid pro quo (this for that) is not love because it is not sacrificial; it is self-serving and self-seeking. This is not how God has loved us and not how we are to love others. As we have discussed in other lessons, repetition in Scripture is a device used to add emphasis to what is being said. Since they did not have exclamation marks, didn’t italicize or use all upper case for words, and didn’t have a way to bold the letters, they used repetition. Repeating something once meant it was highly significant; repeating twice (saying it three times) was like using all upper-case letters AND underlining-italicizing-bolding and adding several exclamation marks!!! Loving God’s Way cannot be faked, pretended, or counterfeited for long because loving like God loves (even with our human limitations) is about much more than just behavior. To agapaō someone is to have a higher regard for them than you do for yourself (Philippians 2:3-4), to have a passionate desire for God’s best for them, even at great expense or sacrifice to yourself. This is something that happens on a heart level, not just with a bunch of words and some temporary actions. His Word includes the commands to “love one another, just as I have loved you.” How has He loved us? “And hope does not disappoint, because the love of God has been poured out in our hearts through the Holy Spirit who was given to us. For while we were still helpless, at the right time Christ died for the ungodly…But God demonstrates his own love for us, in that while we were still sinners, Christ died for us…For if while we were enemies we were reconciled to God through the death of his Son, how much more, since we have been reconciled, will we be saved by his life” (From Romans 5:5-6, 8, 10). So, when we read that we are to “love your neighbor as you love yourself,” (Mark 12:31a) these words take on a significantly powerful meaning. They are commanded by God in the Old Testament and retaught by Jesus in the New. When we give to another with the expectation of receiving something in return, we have just dehumanized and objectified that individual. They have now gone from being regarded in our hearts as a fellow image-bearer of God to a resource for us to have our needs met by. Again, that is not relationship; that is using. In a marriage, this can be an especially easy trap to fall in to. Most people get married because of what needs are being met or what emotions they experience being connected to that other person. That is not a Biblical or a Christian model. To “love another” is to passionately desire God’s best for them, not for you. Another important idea to hold fast to is the idea that the “one another’s” are our brothers and sisters in Christ. We are to love them first and love them best. It is from a solid “one anothering” love that the Body of Christ is able to love the lost. So, let us not forget that, just as God has loved us in Christ, so we are to love others – also in Christ, just as God has loved us. His love is not conditional, and neither should ours be. This is an absolutely beautiful piece, written in a way that gives voice to much of the woundedness – but also the hope – so many of us have suffered at the hand of someone entrusted with loving and caring for us. No longer silent; no longer afraid; no longer victim; forever redeemed! Fed Up. Weary. Jesus is Lord. Fed Up. Weary. Jesus is Lord..
via Fed Up. Weary. Jesus is Lord.. The following is being re-blogged, by permission of the original author, because it eloquently articulates my own views. I fully anticipate people on the pro-life side of things being unaccepting of the message, in spite of its truth and import. They will have to sort that out with their Creator. Please seriously and prayerfully consider this message. I am not trying to ruin your party, rain on your parade, or burst your bubble. I am trying to help you. Come, let us reason together. When hospitals all across America start paying doctors to perform abortions within their walls, it will be the triumphs of pro-life legislation which drove them there. Passing laws that temporarily shut down abortion clinics because they are not close enough to hospitals only strengthens the abortion industry and inadvertently acknowledges the practice of child sacrifice as part of our nation’s healthcare system. Abortion is not health care and we should not be fighting it by passing health-code rules and regulations. 1. Abortion is not any less murderous when it is carried out within 30 miles of a hospital. 2. The abortion industry will meet these regulations. 3. They will clean up their acts and build new killing centers. 4. Some “clinics” will close, but those remaining will pick up the slack. 5. Shutting down clinics doesn’t halt abortion; it just makes people who choose to sacrifice their children drive further. 6. People who choose abortion will only be comforted by the knowledge that the “service” they are seeking is that much safer. 7. They will perform abortions within hospitals if you pass laws against performing them everywhere else. 8. Once child murder services are being performed in hospitals on a widespread basis, the fungibility (sic?) of funds, facilities, and equipment becomes yet another obstacle to abolition, as now the aborticians and their staffs will be further protected by the legitimacy and reputation of the hospital. Do you not see that the abortion industry only gets stronger as they build bigger and better clinics to meet your pro-life standards? Do you not see that they (like you) just raise money from their so-called defeats? Have you not come to realized that no matter how many clinics you shut down, millions of babies are still being aborted every year? Do you not see that the devil himself would allow you to take a few pieces off the board so long as he constantly has you in check mate? Pro-choicers have long stated that they believe abortion should be kept “safe, legal, and rare”. Pro-lifers are positively helping them make it more safe (for the women murdering their babies) and inadvertently keeping it legal because they are focused on making it more rare. We’ve been regulating abortion for forty plus years and it is time that we focus our attention on REPENTANCE, RENEWAL, and REVIVAL. A revival of true Christianity alone holds the key to abolishing human abortion. Repentance will precede revival and revolution will follow it. Abolition will be the fruit of providential revolution. It will not be the gradual end result of pragmatic incremental regulation. 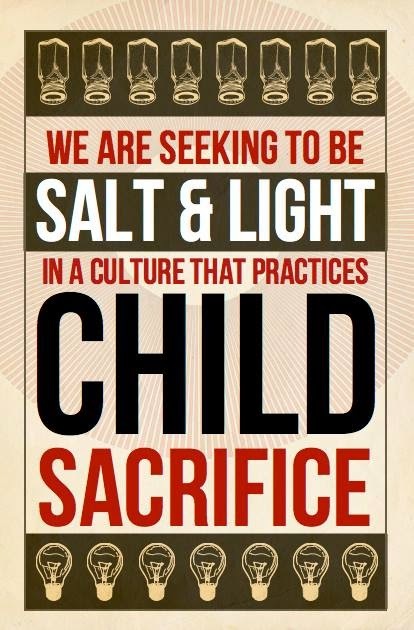 Repentance and revival alone will enable us to sway the country against the practice of child sacrifice. These regulatory schemes are actually delusive distractions. The abortion industry itself may fight against these rules and regulations… but in the end, they will play by your rules so long as their bloody practice is not brought under the law against murder. We are at war with powers and principalities and they are more powerful than you are when you try to fight them within the carnal system they have set up for themselves – abortion as healthcare. If you go to war with these spiritual forces of evil in the heavenly places using worldly wisdom (incremental legislation), you will be losing even when you think you are winning. But when we fight by the spirit of God now dwelling richly within us and bring His Word against the evil of our age, triumph is inevitable. 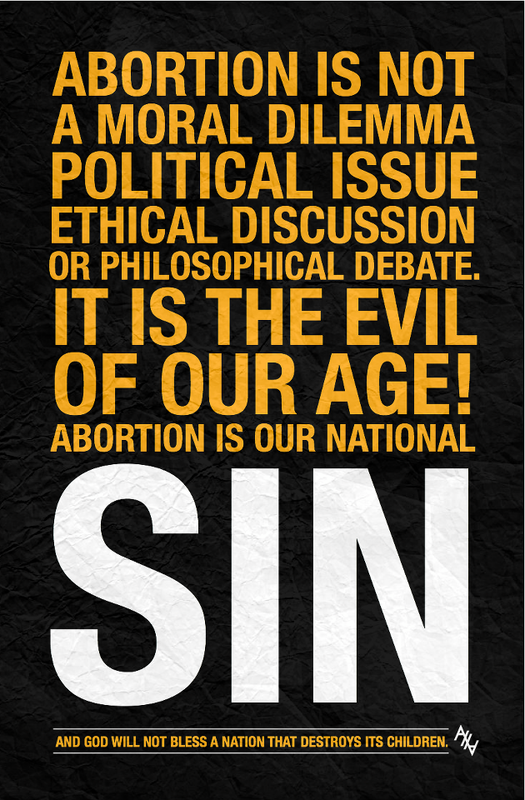 We will conquer abortion by the blood of the Lamb and by the word of our testimony. We will not conquer it by regulating it. Thank you for reading this message. I hope and pray that you are able to see it for what it is and assess it with the mind of Christ. Thanks to T. Russell Hunter for permission to re-blog! The world needs your witness here.